Ali and Matthew will receive the award together at the 2018 Katz JCC Sports Award Dinner on Monday, Sept. 17. Twins Ali and Matthew Karpousis admit they have somewhat opposite personalities. Ali describes herself as the more serious of the two and an overachiever in the classroom, while Matthew describes himself as the looser and funnier of the two. Despite the differences, Ali and Matthew have a lot in common. Both are accomplished athletes, with Ali’s best sport being gymnastics and Matthew’s being baseball. Both also share a drive to better their community through volunteerism, as they have given back to multiple nonprofit organizations. On Sept. 17, Ali and Matthew will share one more thing in common. 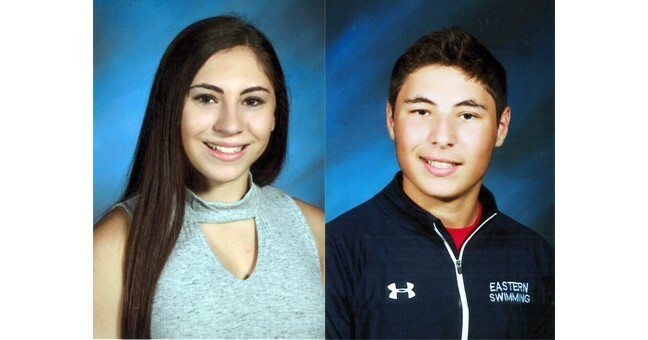 The two will receive the David Back Memorial Maccabi Award at the 2018 Katz JCC Sports Award Dinner. It is the second time the award will be given to two people the same year. Twins Emily and Perri Brenner also received the award together in 2003. “It’s pretty cool, especially because we’re twins and twins kind of share a connection,” Ali said. Ali and Matthew are Voorhees residents and seniors at Eastern Regional High School. Both have played sports since they were young, but became a big part of the JCC community just four years ago. When the JCC Maccabi Games were hosted in South Jersey in 2014, Ali and Matthew competed for the first time. Matthew took the field for Team South Jersey in baseball, while Ali competed in swimming since gymnastics is not offered in the Maccabi Games. Both Ali and Matthew have competed in swimming during the summer for Charleston Swim Club in Cherry Hill. Ali and Matthew both said the 2014 Maccabi Games were an experience unlike any athletic event they participated in before. Both twins continued to compete in the games until they aged out of the event following the summer of 2017. The Back Memorial Maccabi Award isn’t just about on the field accomplishments. The award is given annually to a JCC Maccabi athlete who displays leadership qualities on and off the field. Ali and Matthew have been community leaders in a number of ways. Together, the two annually raise money with fellow family members for Susan B. Komen Race for the Cure. Matthew also raised money for the Memorial Sloan Kettering Cancer Center through his performance on the baseball field when he was younger. In addition to his fundraising, Matthew has also volunteered his time at the Indian Culture Center of South Jersey and is a volunteer baseball coach with the Gibbsboro Voorhees Athletic Association. Ali is a member of Eastern’s National Honor Society and regularly volunteers with other NHS members at the Cathedral Kitchen in Camden. Ali also volunteers at Ronald McDonald House, something she particularly enjoys. Matthew and Ali admitted it was a pleasant surprise when they found out they would receive the award. The two were informed of the news during the last week of August. Matthew said he is looking forward to seeing many family and friends at the event, while Ali said she is looking forward to the speech they will give. “I’m pretty excited to give this speech because I think Matthew and I are going to do something funny together,” Ali said. Ali and Matthew want to encourage other kids in the community to join Team South Jersey and participate in the Maccabi Games. Both credit the event to helping them become better people and speak highly of the relationships they’ve built with friends, both locally and far away. “It’s a nice way to stay involved in the Jewish community,” Ali said.